Some reporting indicates that echelons below the General Staff -- such as SRF command posts -- have the technical ability to launch without authorization by political leaders or the General Staff. Human sources have repeatedly warned that the controls over some tactical nuclear weapons are poor; these appear to be the weapons most at risk. An array of evidence indicates that political authonties could not prevent the General Staff from launching nuclear weapons on its own initiative. (U) At the January 1994 Moscow summit, Presidents Clinton and Yeltsin announced that they would direct the detargeting of U.S. and Russian strategic missiles, respectively, so that by May 30, 1994 none of these missiles would be targeted against any country on a day-to-day basis. The United States implemented detargeting by May 30, 1994, and the Russian government notified us that it also implemented detargeting on schedule. (U) This detargeting initiative was a confidence-building measure that symbolizes the improved relationship between the United States and Russia. In this regard, lt is one of a series of such measures adopted in the aftermath of the Cold War, including discontinuing strategic bomber ground alert and continuous airborne command post operations, and withdrawing and eliminating certain tactical nuclear weapons. (S) Placing ICBMs in a non-targeted status does not remove them from combat duty and only slightly reduces their readiness. For Russian ICBMs detargeting means that targeting and flight data have been downloaded from the missile's onboard computer and replaced with a zero or null target set. Such data, however, remains stored in the fire-control computer and can be reloaded into the missiles's onboard computer within a few minutes. The impact of detargeting on combat readiness is thus easily reversible and cannot be directly monitored by national technical means. Unless a missile is actually demated from its warheads, defueled, and removed from its launcher, the Intelligence Community is unable to monitor a change in its combat duty status. (S) Russian nuclear-powered ballistic missile submarines on pierside duty or on patrol in peacetime operations do have targeting data stored within the missiles. These data are stored on tapes locked in the commanding officer's safe on board the submarine. These tapes are loaded only when the submarine receives a valid shore command, which activates the fire-control computer and authorizes the ship's commanding officer to remove the tapes from his safe and initiate pre-launch preparations. The detargeting agreement thus required no change to Russian procedures and did not change Russian SLBM readiness (nor that of US SLBMs). (U) As political commitment, rather than a treaty obligation, there are no procedures to verify detargeting. Effective verification would not appear feasible, nor would attempts at verification make sense, given the fact that the process can be reversed within a short period of time. By the same token, however, since U.S. missile crews could quickly reconfigure equipment to prepare to launch missiles if so directed, detargeting does not in any way reduce U.S. security. The principal purpose of detargeting was to take an additional step which symbolizes the improved strategic relationship between the United States and Russia. His comments suggest that he is also worried about unauthorized nuclear use,2 but this is probably of lesser concern. Although he thus far has not directly addressed warhead theft, other Russian military officials have, and this is probably an additional source of anxiety. 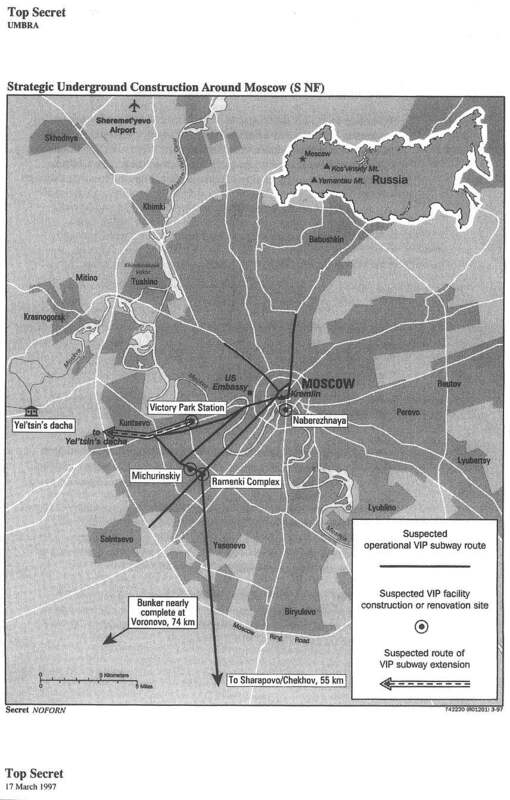 According to the US defense attache and satellite imagery, work has progressed on extending a deep subway for rapid evacuation of leaders during wartime from Moscow; a Russian press report in 1995 described this project. Recent satellite imagery shows construction is nearly complete on a governmental relocation bunker outside Moscow, although work on the bunker appeared to have stopped some time ago. Several similar sites remain abandoned. -- Satellite imagery shows continued excavation at the deep, underground complex at Yamantau Mountain and new construction in each of its aboveground support areas. President Yel'tsin and Premier Chernomyrdin apparently have endorsed such projects. In January, authorities barring defense attaches from access to Yamantau cited a decree Yel'tsin issued in November on maintaining the project's security. Press reports have mentioned similar decrees. -- The federal budget for this year lists a subsidy to the closed city building Yamantau -- the first public reference to funding for the facility. The underground construction appears larger than previously assessed. Two decrees last year on an emergency planning authority under Yel'tsin with oversight of underground facility construction suggest that the purpose of the Moscow-area projects is to maintain continuity of leadership during nuclear war.